In my opinion, cleaning and planting outdoors is no different than cleaning and decorating indoors. If a room is messy, the best way to clean it up right is to gut it, then start over. You know those magazine perfect gardens with everything just so? Well… that isn’t realistic in my yard. I have no idea how some can maintain a house and garden, both to perfection. There’s only one of me. How do they divide themselves into 5 people? Dunno. But whatever the case may be, I commend you. I really do. 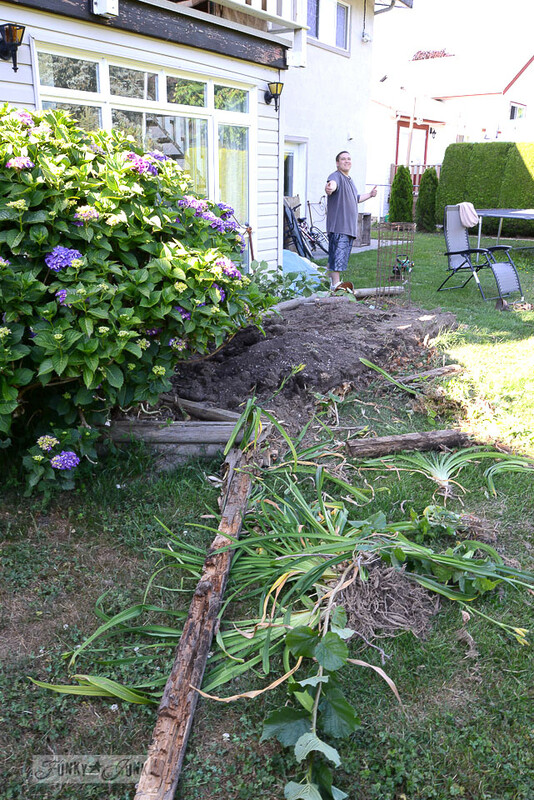 So today, I am going to first share how to revive flowerbeds you don’t take care of. 1. 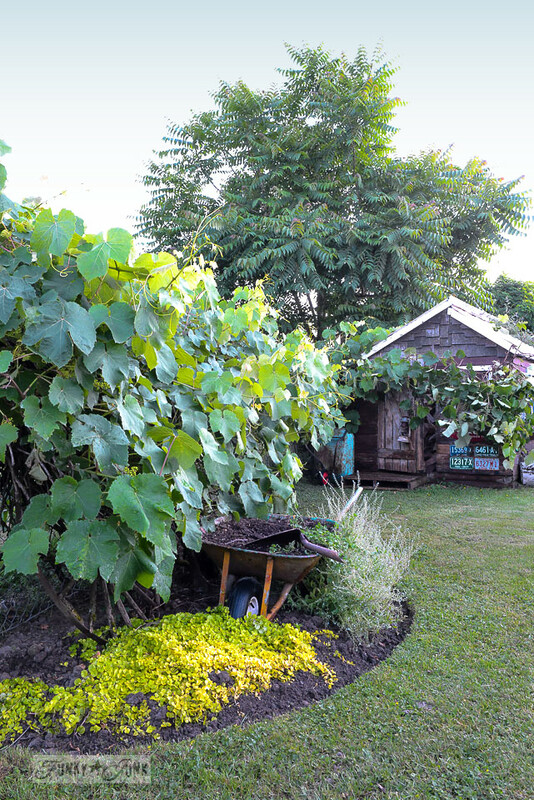 If you don’t want a vegetable garden, please quit pretending you do. Year after year. The only one you’re fooling is your lack of time. And your wallet! Welcome to my vegetable garden! 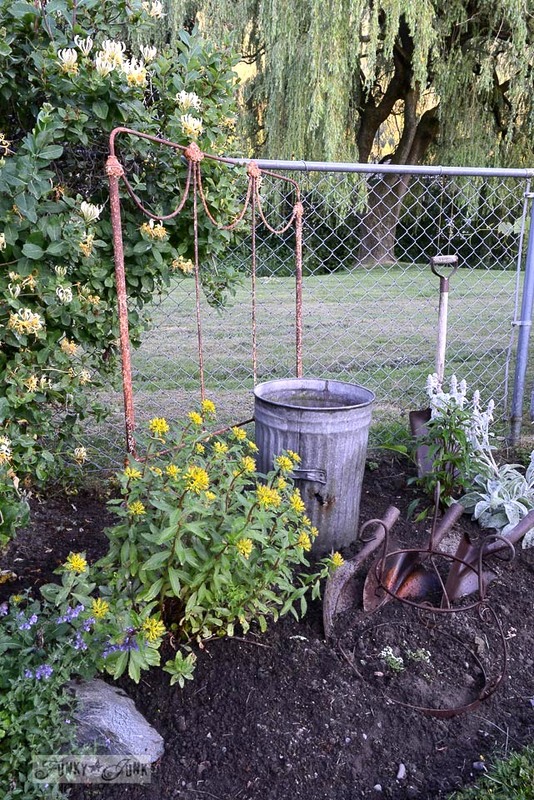 For cryin’ out loud… I decided I will no longer pretend to even want a vegetable garden, and just plant flowers and stuff instead. If that. Done. So done. The last two years I threw the rotten veggies in the compost for the rats wondrous fertile compost I didn’t dig out either. Perfection. I love fresh veggies. I really do. But if you let your potatoes grow for 2 (or was it 3?) growing seasons because you never bothered to dig them up, you may be done too. 2. 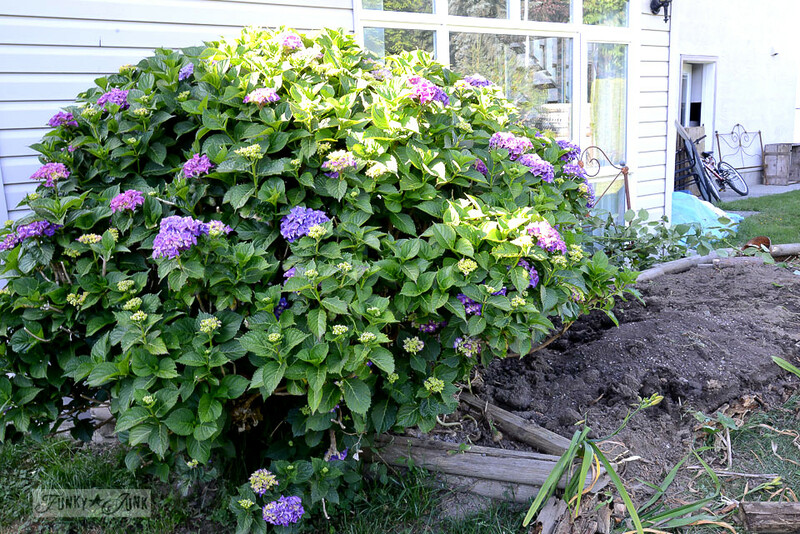 Plant hydrangeas, especially if you live in the west. Then ignore them. Forget to prune, especially. They LOVE that! You will too! Look up hardy perennials for your zone, and plant those. Trust me. Please don’t ask me how these hydrangeas thrive year after year. It must be our rain. But be assured, it is not because of me. I don’t deserve to be blessed with this beauty, but I am going to cheat and accept anyway. Plants that haven’t bloomed in years, out! 3. Promise to pay your son in food or money for his amazing strength, and he may even smile for the camera. For a quick 5 min or so. 4. If you can’t keep up with it, mow it instead. Or in our case, host a very dirty sandbox. Once I figure out what to do with this, we’ll take care of it. 5. 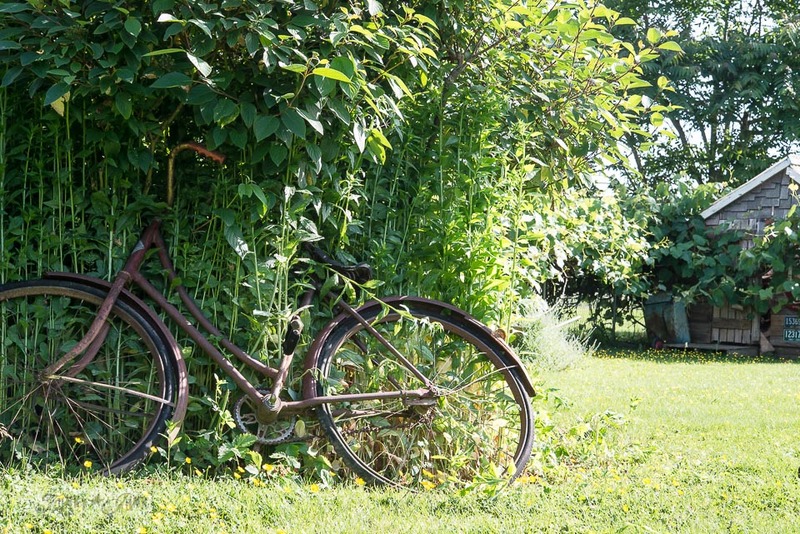 If you have a weed infested yard, prop an old bike against it for that romantic barnyard feel. All that’s missing is a cow pie. 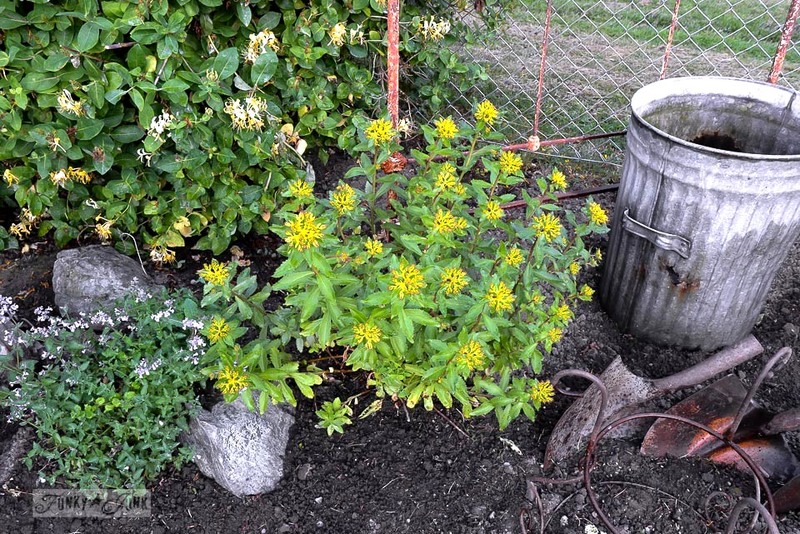 I seriously have a post written about taking advantage of perennials in your yard HERE. 6. If your beds are riddled with weeds, pretend you’re the weatherman and your monsoon forecast came true… saturate the soil with water, then weed. Yes. This is the same corner. Can you believe there was a pretty cute tree under that mess? b) Water the soil well, then pull out the weeds. 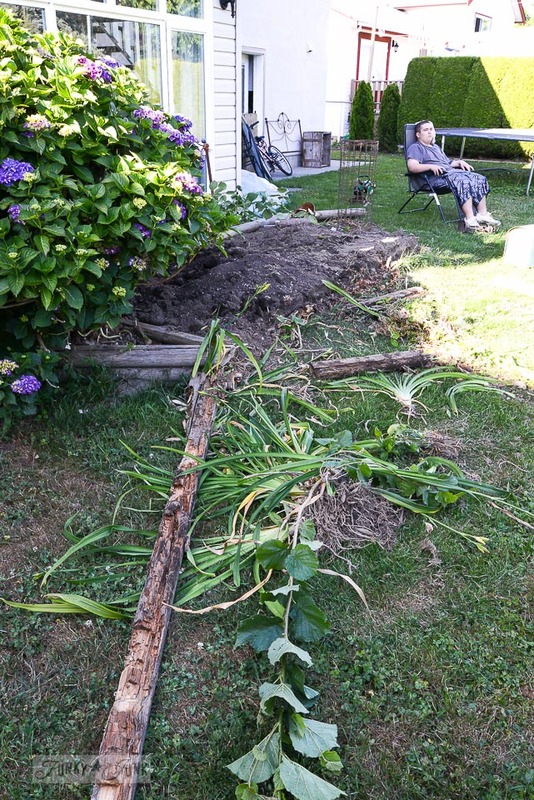 d) Edge your flowerbeds like a pro… for free. My tutorial is HERE. e) Fluff up the soil, or better yet, top it up each year. 8. No beach nearby? Pull off that summertime vibe by using a pool ladder for your trampoline… that you no longer use either. 9. Get rid of the trampoline and ladder. Anyone local want them? Must have truck…. Not a weed in sight. Even the soil at the base of the trees got cleaned up! So proud. 10. 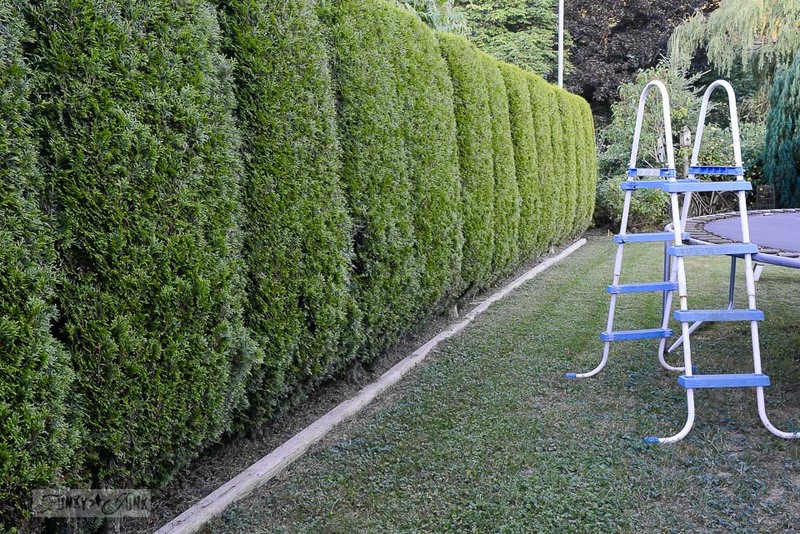 Running a landscape tie against the base of a row of trees is an easy way to keep things cleaned up. 11. Seriously… the best and final tip is to edge your flowerbeds on a curve for free with just a half moon edger. It will give you an upscale finished look that will blow you away! 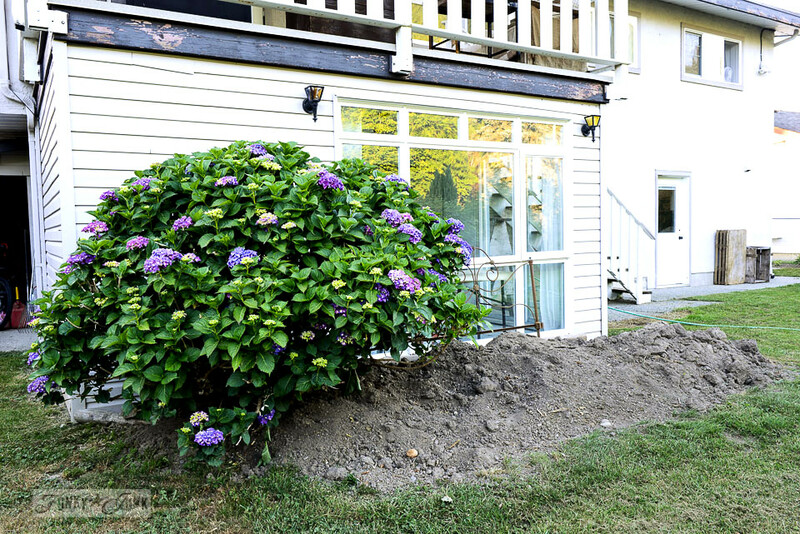 How to edge your flowerbeds like a pro… read it HERE. The flowerbeds are far from perfect. They are still flowerless. But at least they are CLEAN! And now ready for more. 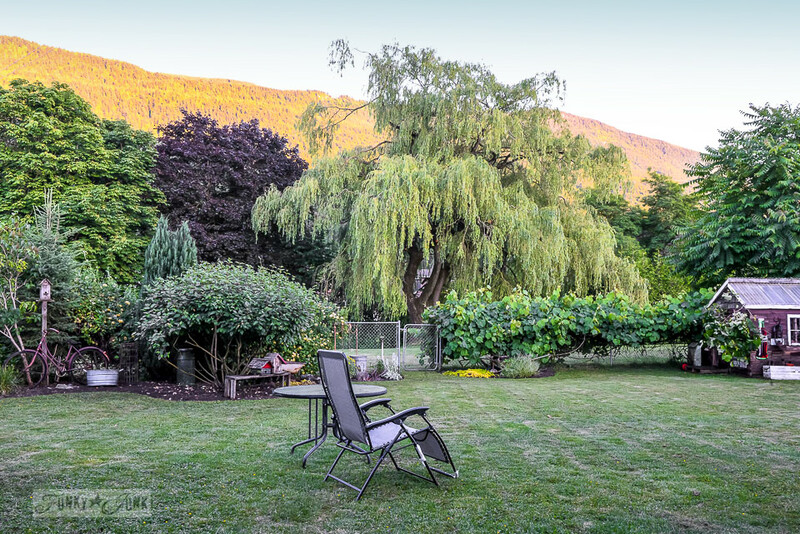 Just for fun, here’s a post where my yard has never looked better…. it was a good year! Read it HERE. Love your honesty on life’s realities! It has basically rained nonstop here, and just dealing with the tall weeds is challenging. Then my husband fell ill, and now has advanced cancer, and the yard is mowed by a friend, but the weeds await me on this 2 acre place. We never put in a garden, so at least that is not looming over us. Your place looks wonderful, good work! Karen, I’m so very sorry to hear about your husband’s illness…I’d imagine you are struggling with so much right now. I dearly hope he will be okay. Please try to go easy on yourself right now…you can’t do everything all at once, right? Remember to take care of yourself, too…by doing so, it means you will be there when your loved ones need you. Sending much healing energy out to you and your husband and I’ll be keeping you in my thoughts. Your yard will still be there whenever you have time to get back to it. For now the important thing is you and your husband. I hope he will be okay. I have no connection with it, but I feel it has important information. This is exactly how I spent my weekend. How does everything grow so fast on neglect?? Your flower bed looks so picturesque now! You inspire me so. Makes me want to leave my desk and march outside to edge my garden!! Any tips on keeping deer away? 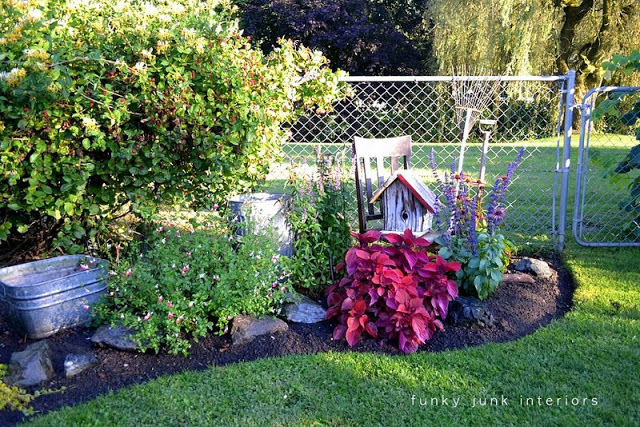 What a difference Donna – your flower bed looks fabulous! We curved our flower beds a few years ago and it added much more interest. I was just saying to Mr. Frugalista on the weekend that our beds need some serious help. I can’t tell a weed from a flower but it all feels so overwhelming. Going to try your watering the soil first before weeding. 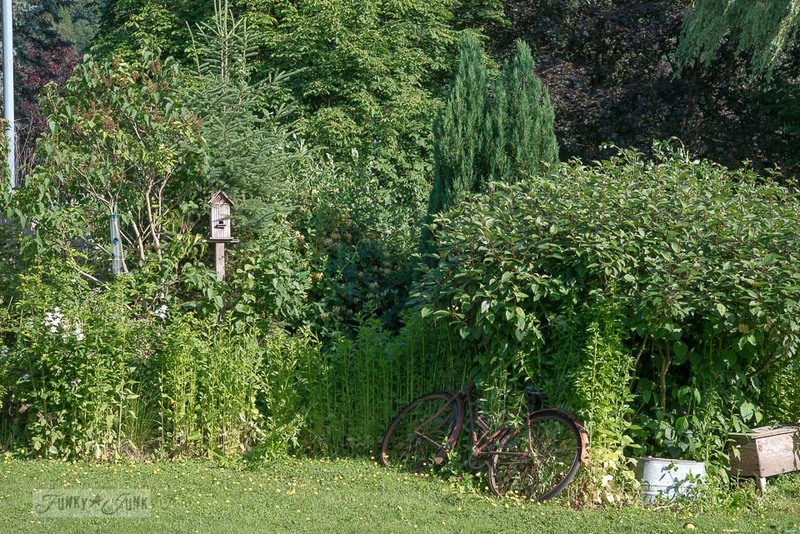 Hopefully I’m pulling weeds rather than plants – yikes! Living in SD, where I carry a swimsuit & snow shovel in my car trunk because it’s possible I might need both on any certain day, gardening is a challenge. From May-Sept. SD has hailstorms plus I am also alone maintaining a huge yard that 35 yrs. ago was red clay and rock. Not wanting to think about the time and money I’ve spent on things I want to grow, I now plant only perennials and tuck veggies and “non destructive” flowers like geraniums and marigolds in my flower and herb beds. Would you believe I edged all my beds for the first time this year making an incredible difference…all thanks to your post! It looks like your son can hardly contain all that glee! 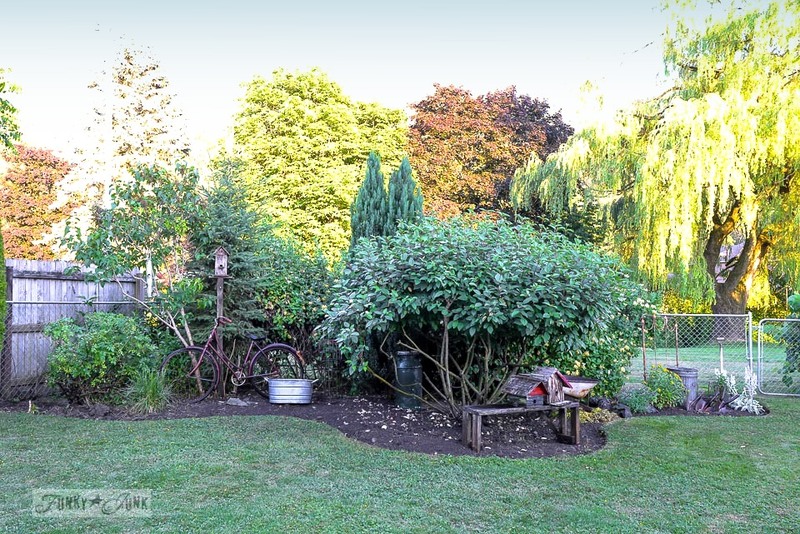 Seriously…your yard is looking great. We know our gardening limitations…a few cherry tomatoes (already harvesting – really sweet! ), 8 green bean plants (We’ll probably get five handfulls this year!) and we’re trying a different regular-sized tomato plant. The others have failed miserably. I think we might get a carrot or two — at least we got that many last year! Oh, and maybe a dozen strawberries off the one plant. I didn’t even expect fruit. They called it an ornamental, and I bought it for the flowers! Enjoy! Donna, For me, this was one of your best posts…..EVER. Once again, you were real and showed us that lots of us are not perfect….in the yard or in the house. That we are not the only ones who have overgrown, out of control weeds at times, have bitten off more than we can chew because it seemed like a good and doable idea at the time. In the spring I want to buy Everything and usually have too many flowers (too many annuals) to take care of by mid-summer. And then I think that buying perennials would have been a better investment in the long run. Kinda like the tortoise and the hare….I want too many blooms too fast instead of being patient and waiting for more long lasting plants. One horticulturist I know liked to plant what he called ‘green gardens’. Just beautiful green grasses,etc. It was simple and beautiful…and easy care. Sometimes, when overwhelm starts to take over, I want to eliminate most all of it and turn it back to grass. Bit by bit I will probably do some of that by pushing the outer edges of the flower beds back. Maybe it follows that less is more. Love your yard.. I started a garden this year to give food to the mission and I have been weeding ever since. Glad food and pay got your son to help.. I couldn’t even bribe mine with those goodies.. ha ha. Hi Donna, oooh so pretty and so neat and clean I have a lot to do in my yard, mostly the concrete jungle lol but I do have potted plants and a very small herb garden, trying again this year, fighting with critters, ick ick ick! Anyway love your yard, I might plop a 40 footer container back there and make another workshop or dogette house lol. Anyway wanted to let you know following you a long time, love all your ideas and creative soul. Yes! I need some kind of workshop extension, but it’s not easy with our septic system in the way. Still dreaming that one up. You make it looks so easy, Donna! That view is breath taking. Give me mountains over a beach view any day! Wow, what a difference a lot of work makes! Your sweet birdhouse and all your funky treasures really pop now. Can you send your son down this way to work in my yard? After you get your yard all finished and it looks wonderful, don’t you wish you could push a button to make it stay that way?! I would love to use an edger on my flower beds. But seriously it is impossible. We grow rocks, you can’t dig with a shovel, you literally claw out a hole with a hand claw & a heavy steel fence post to break up the rocks. So, I will keep my flower beds but they will never bed beautifully edged. I have always loved your garden pictures. Jen, you make a valid point. Rock is indeed an issue! I’d be inclined to create more raised flowerbeds if that was the case. Your flower bed looks cute to me! 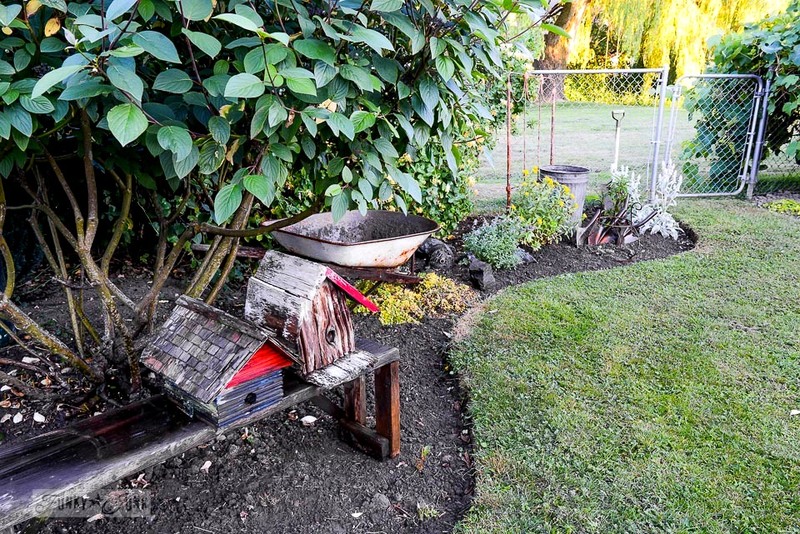 I have always loved the look of a shovel edged garden bed. 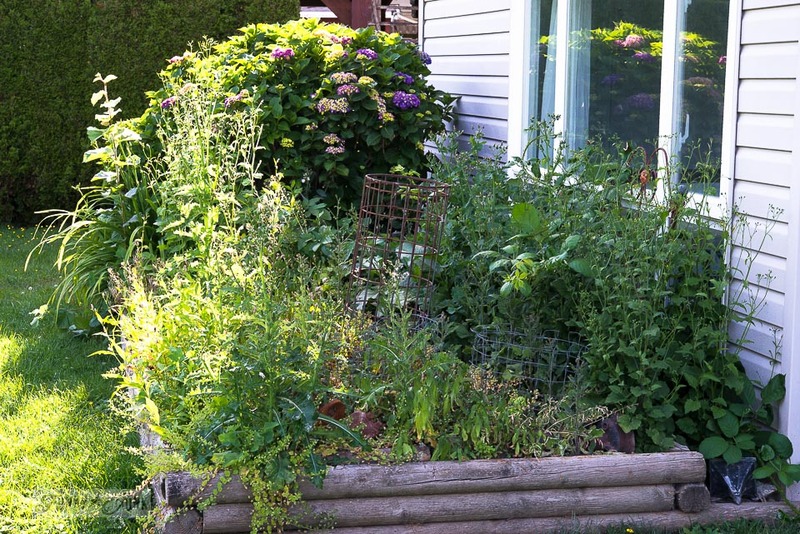 It adds a maintained air to event the worst kept garden – and I’ve had more than my share! I’ve resorted to raised beds for my veggies – I just don’t have the energy to fight my clay soil for another year. it really does look beautiful!!! Rhonda, blackberry bushes are HARD to control. I’d be inclined to clip them right to the ground if you don’t want them any longer. But be very diligent, they’ll come back up each year unless you dig up the roots.